Instead of relying on expensive drain cleaners to clear the clogs, we decided to go straight to the source when I discovered that the number one reason our drains were running slowly was hair creating a blockage. I would catch the hair before it caused problems in the pipes. All I needed was the best drain hair catcher for our bathtub, shower, and sinks. The drain protector (hair catcher) I chose for our bathtub is working perfectly. It was easy to install, and it is simple to maintain, too. Even though we take baths every day, I’ve only had to clean it every couple of weeks. And I’ve noticed that the tub drain doesn’t clog anymore. I’ll describe the top drain hair catcher now, then figure out the pros and cons of the other ones I considered for my home. 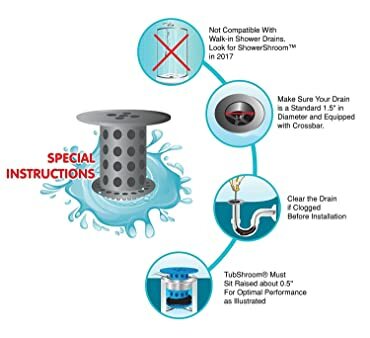 I hope this review will help you discover the best drain protector for your home as well. When I began to shop for drain protectors, I had two goals in mind. The top priority had to be ease of installation. Then the second characteristic I wanted was a simple way to clean it. The TubShroom met both of my criteria. It was fortunate that our bathtub drain didn’t have a built-in stopper or a mesh screen. All I had to do was slide the TubShroom into the drain opening where it rested on the crossbar below. The top part of the catcher protrudes approximately a quarter-inch above the opening, which hasn’t been a problem at all. Instead, its silicone body is easy to grasp and remove. One point you’ll need to consider is the size of your drain opening. Ours is a standard 1-1/2-inch fitting, which is ideal for the TubShroom. Another thing to check is whether you can remove any drain cover or stopper you might have in your bathtub. If you can’t, you might not be able to use this particular hair catcher. Also, when using the TubShroom, you can’t stop up the drain for a bath unless you pull it out first. Since we usually take showers, this hasn’t been an issue for us. I tend to remove the TubShroom once every week or two to wipe off the hair it caught. And that is one of the best features about the TubShroom. The hair collects around the base, out of sight. It’s almost effortless to wipe clean with a little of toilet paper that I toss in the trash. Finally, the TubShroom comes in five colors like Marine Blue, Organic Green, Autumn Orange, and Neutral Gray. We selected Clean White for our bathroom. Besides the TubShroom, I looked at a few other drain hair catchers. You might also like one of these that I describe below. The OXO Good Grips Drain Protectors are made of silicone like the TubShroom, but they have a very different design. Instead of inserting them inside an opening, you can leave them positioned over the top. They are 4-1/2-inches in diameter, large enough to fit a variety of drains. If you have a bathtub drain with a built-in stopper you might prefer this style of hair catcher instead. At 2 inches tall, the OXO protectors will fit over the top of the stoppers that pop up. Finally, you don’t need to worry that the OXO hair catcher will wash away. It’s weighted on top with a stainless steel disc. On the downside, this particular protector is rather large and obvious-looking, and it only comes in a light gray color. Plus, the hairs collect on the outside where they are visible. If you would prefer a flat drain protector that doesn’t call attention to itself, you might like the stainless steel one from OXO that I will review below. The OXO Easy Clean Shower Stall Drain Protector doesn’t replace your current hardware. Instead, it lays over the top of your drain with no installation needed. The OXO specifications state that the protector measures 4.8-inches in diameter. But since it’s made of stainless steel, it blends in well. The small holes will block most of the hair and rubbish that tries to escape down the pipes. And although the main body is rust-proof steel, there is a thin rim of silicone on the bottom to keep the protector from sliding around in the tub. I’ve covered three ways to protect your plumbing in the bathroom, but what about the kitchen? Below is a two-piece set that will keep food bits from clogging up your sink. 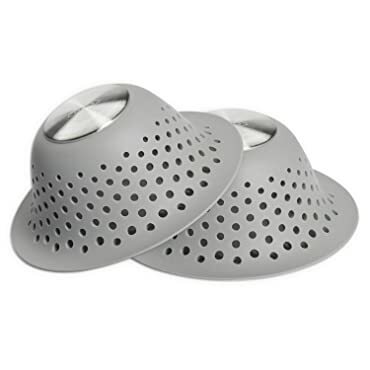 Fengbao’s two-piece stainless steel sink strainer set will fit most kitchen drains. 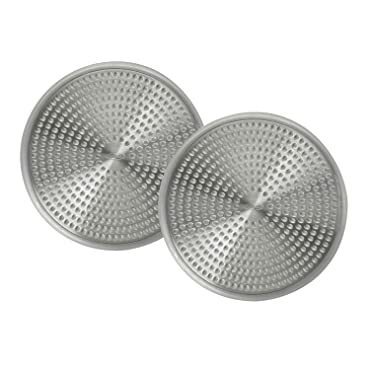 Each strainer’s concave center measures 2-3/4-inches in diameter, with a large lip that makes it 4-1/2-inches total. Then, since the strainers lay flush with the sink’s surface, you can lay a mat over the top. 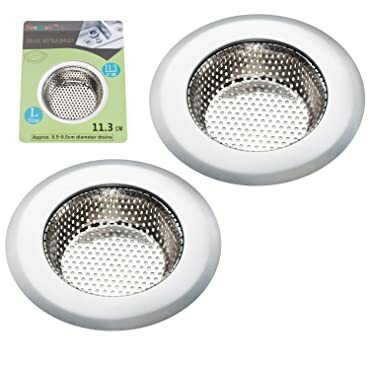 And unlike typical drain protectors you see in kitchens, these have tiny 2 millimeter holes, small enough to catch food particles, fibers, and hairs, but still allow water to pass through. They are rust-resistant and easy to clean. I chose the TubShroom for my bathroom because it is incredibly simple to install and maintain, plus it came in a color that suited my bathtub. I also appreciate the fact that I don’t have to see the accumulated hair unless I remove it for cleaning. All of the other strainers and drain protectors I listed today are very easy to put in place. Most will require frequent attention because the build-up of debris will be visible. Finally, since most homes have stainless steel or chrome fixtures, all of these drain hair catchers should match the typical hardware. In case you skipped here to the bottom, I’ll recap the highlights of each drain protector. The silicone TubShroom comes in five different colors. Just insert it into your bathtub drain opening, and it will gather hair and debris, keeping the accumulated mess out of sight. If you have a stopper that raises up out of your drain, try the OXO Pop-Up Protector instead. It’s weighted to stay in place and lets you open and close the stopper without removing it. But if you have a shower stall, you might prefer the OXO Drain Protector. It’s a steel disc with a silicone rim that keeps it from sliding. Finally, if you want to keep your kitchen sink from running slow, try the Fengbao Stainless Steel Strainer. The micro-perforations do a superior job of catching all sorts of rubbish before it goes down the pipes. In conclusion, I hope you found the perfect drain protectors for your home today.